Arrive in Sri Lanka. Clients will be welcomed by representatives of Asian Escapes & transferred to Negombo. 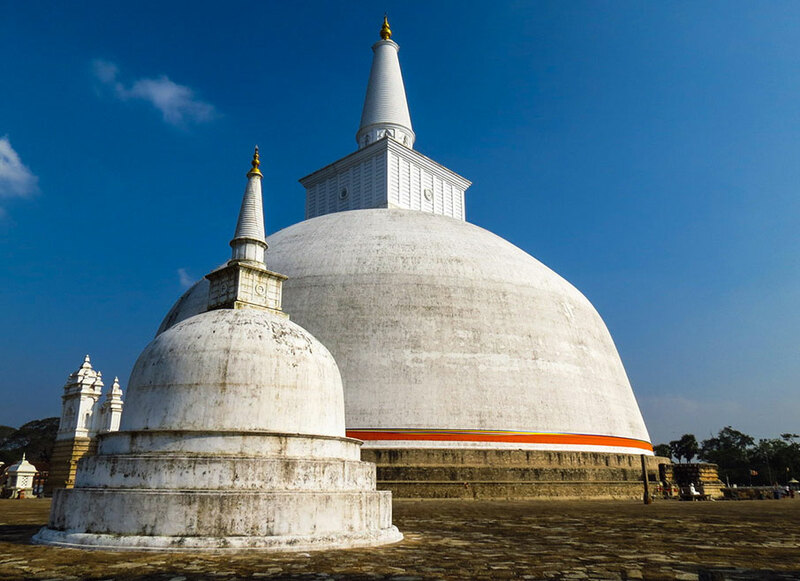 Anuradhapura – This “City of Ruins” and home for the “Tree of Enlightenment”, popularly known as “The Sri Maha Bodhi”, is not only one of the most sacred places for the Buddhists but also a great Tourist destination. This city has so much to offer to the Pilgrims and Tourists alike. Among the important sites are the great white and fine Ruvanweli Seya (Dagoba / Stupa), the small but important Thupārama Dagoba, Huge 75m high Abhayagiri Dagoba, 70m high Jetavanarama Dagoba, the Brazen Palace which had been a nine story building of which the roof was bronze built on 1600 stone pillars (now only the stone pillars are to be seen) etc. This vast area that has been hidden away in the thick jungle for a long time and now turned into one large garden has ruins of so many Temples, Palaces, Monasteries, Monuments and other important places of interest to be seen. After breakfast leave for Polnnaruwa via Mihintale. Located 8 miles from Aunuradhapura, Mihintale is called the “Cradle of Buddhism in Sri Lanka”- it was here that the Buddhist doctrine was first preached in here by the monk Arahath ‘Mahinda’, to King Devanampiyatissa more than 2000 years ago. Mihintale – ‘the hill of Mahinda’ is approached by a magnificent, wide, ancient stone stairway of 1,840 steps. This is the World’s first declared sanctuary from 247 B.C. and continues to be one up to this day. Some of the monuments found here are the oldest in the country and the large number of Brahmi inscriptions dates from the 3rd century B.C. Kantaka Cetiya, Ambastala Dagoba, Maha Thupa, At Vehera, Alms Hall, Girihandu Seya, Indikatu Seya, Old Hospital and Kaludiya Pokuna are some of the interesting sites at Mihintale. 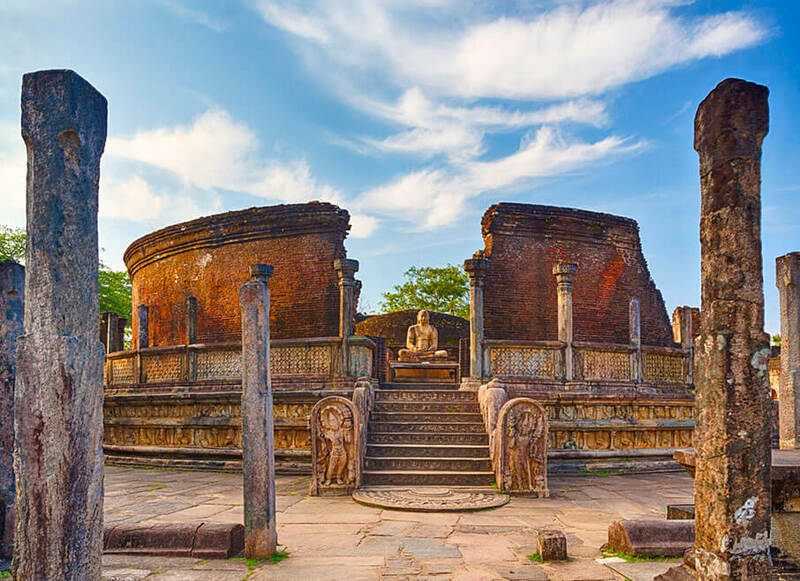 Polonnaruwa –another “World Heritage Site” was the Capital of Sri Lanka from 11th – 13th Centuries, contains some splendid and spectacular statues. Lankatilake, Tivanka and Thuparama are the most beautiful and largest Image Houses and Tivanka has the best example of frescoes of the Polonnaruwa period. Rankoth Vehera and Kirivehera are well preserved large stupas, and Gal Vihare – a rock shrine, has four Buddha statues, two seated, one standing and one reclining and Parakrama Bahu statue are examples of Sinhalese stone carver. The Vata-da-ge is a unique creation of the Sri Lankan artists. The medieval capital was fortified with inner & outer moats and inner & outer walls. The Parakrama Samudra is on the western side of the city. The Royal Palace, Audience Hall and other buildings in the inner city were enclosed by another tall. 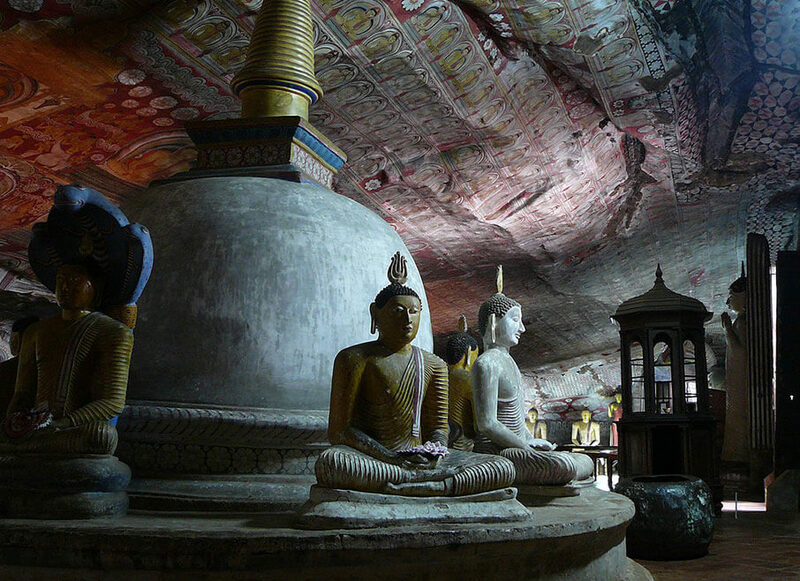 Visit Dambulla cave temple – Dambulla is famous for the five caves Temple on a rock. The first 03 caves are better, older and larger than the other two. Some caves dates to 1st C.B.C. All the 5 cave walls and ceilings are covered with Buddhist murals and there are more than 130 Buddha statues, statues of Gods and Kings are also found here. Sigiriya – King Kassapa ( 477-495 A.D) who shifted the Capital from Anuradhapura to Sigiriya made a fortress to surround his palace, which was constructed on the summit of a 500ft high rock, with necessary facilities. The Palace was surrounded by an outer-moat and wall and Inner – moat and wall pleasure garden, Mirror-wall, light coloured and dark coloured damsel’s frescoes, to cover the western wall and a beautiful staircase through the body of a Crouching Lion are some of the attractions here. En route visit Spice Gardens at Naula – You will see many spice gardens at Matale and in Mawanella on the Colombo-Kandy road where Cinnamon, Cardamom, Pepper Creepers and all other spice trees, plants and creepers are planted for visitors to see them. Spice products are also available for those who would like to buy them. At all Spice Gardens visitors are taken round explaining each tree and plant and at the end explaining the use of them food preparations. Proceed to Kandy and visit Aluvihare Temple in Matale. Aluvihare Temple – is a cave temple with unique series of monastic caves are picturesquely situated among rocks that have fallen from the mountains high above the valley. The importance of this temple is that the Buddhist doctrines were first transcribed into Pali Text at Aluvihare Temple is 1st Century BC after having been handed down orally for several centuries. Kandy – is the hill capital and the venue of the annual Perahera. The last stronghold of the Sinhala Kings was finally ceded to the British in 1815. Kandy is an example of the Buddhism’s influence in Sri Lanka today. Temple’s shrines and monasteries keeping alive Buddhist traditions are everywhere. 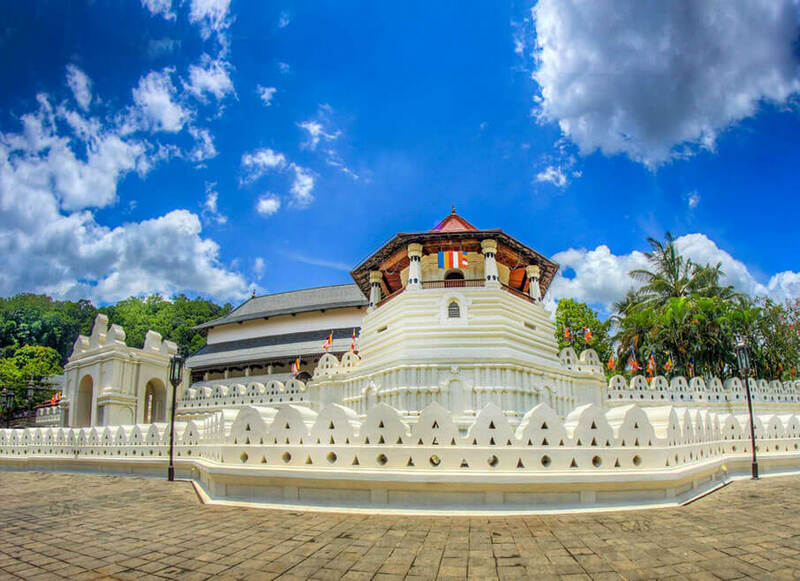 To Buddhist of Sri Lanka and the world, Kandy is one of the most sacred sites as it is the home of the ‘Dalada Maligawa” – Temple of the Sacred Tooth Relic of Lord Buddha. Evening witness a Cultural Dance Overnight stay at a Hotel in Kandy. 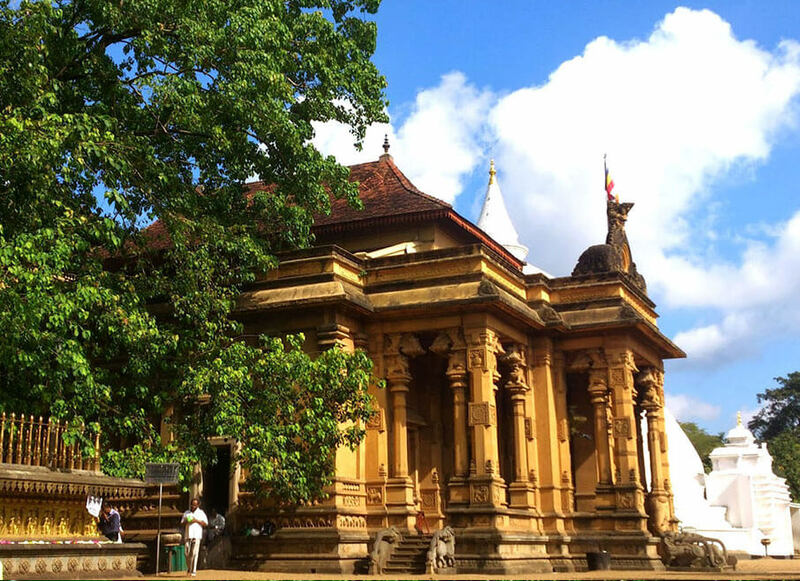 Kelaniya Temple – Buddhists believe the temple to have been hallowed during the third and final visit of the Buddha to Sri Lanka, eight years after gaining enlightenment. According to the chronicles the Stupa at Kelaniya enshrined a gem-studded throne on which the Buddha sat and preached. The temple is also famous for its image of the reclining Buddha and paintings which depict important events in the life of the Buddha, in the history of Buddhism in Sri Lanka, also incidents from the Jataka tales. 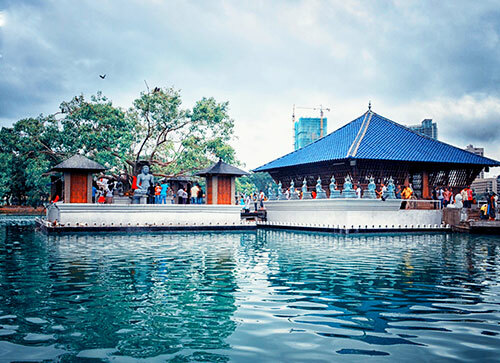 Colombo – is the business and commercial center and the new capital is Sri Jayawardhanapura Kotte, which is only a few miles away. Colombo was only a small seaport, which came into prominence in the 16th Century with the arrival of the Portuguese in 1505 and the development of it as a major Harbour during the British period and became the capital in 1815 after Kandy was ceded to the British. The remains of the buildings during the period and the Portuguese, Dutch and British rule are found in every area of the city. None of the Portuguese & Dutch fortifications are found today but some of their buildings and churches could be seen in the Fort & Pettah areas. Visit Fort, the former British administrative center and military garrison, Sea Street – the Goldsmith’s quarters in the heart of Pettah, the Bazaar area where there is also a Hindu Temple with elaborate stone carvings, the Kaymans Gate with the Belfry at the original gate to enter the Fort, the Dutch Church of Wolfendhaal dating back to 1749, Davatagaha Mosque, Colombo Museum and the Natural History Museum are some of the sites to be visited. Also visit the BMICH (Bandaranaike Memorial International Conference Hall), see the replica of Avukana Buddha and the Independence Square. After breakfast & transfer to the Bandaranayke International Airport for the flight back.